Have you been enjoying reading Cardcaptor Sakura: Clear Card, the new sequel of the phenomenal magical shojo manga by CLAMP? Does it take you back to the good old days watching your favorite show with your friends? Well, it's 2018, and Crunchyroll has taken it up a notch by hosting Cardcaptor Sakura Movie Night for 3 nights only–– January 31, Feburuary 3, and February 4! Find the theater near you and buy tickets HERE! There were so many amazing anime based on Kodansha Comics in 2017. In fact, some of those series (8, to be precise) are runners-up for this year's Crunchyroll Anime Awards. 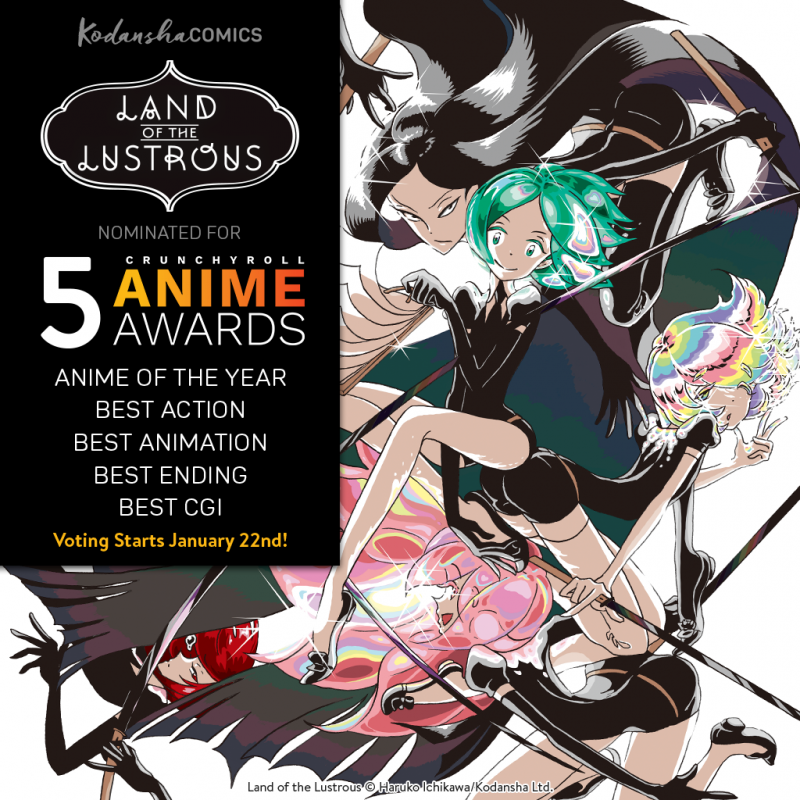 Whether you're a fan of the manga or the anime, your vote matters and counts towards the glory! So let's get together and root for these nominees! Now that trailers for the Alita: Battle Angel movie have hit the internet, it's your big chance to tell everyone what Alita is all about, right? But how much do you really know? Of course, as a manga snob, you already know the Alita movie is based on the manga Battle Angel Alita by Yukito Kishiro. B-but when your friend asks for more intel, here's the cheat sheet you need to show off your true knowledge. After 10+ years of shenanigans, Hiro Mashima's legendary fantasy manga Fairy Tail is coming to an end—with final volume 63 hitting stores January 23. But don’t say goodbye just yet! We're counting down to the conclusion of our beloved bestselling fantasy shonen series with an online celebration RIGHT HERE at Fairy Tail Hideout! With sensational art style and riveting story set in a world of man-eating Titans threatening humankind, Hajime Isayama’s dark fantasy Attack on Titan has touched a nerve in our own time of historical uncertainty—and its popularity has only grown with the hit anime now on the cusp of Season 3 ... but the story doesn’t stop there! There’s nothing more exciting than anticipating next season’s anime blockbusters—especially if it’s one of your favorite manga that’s making its anime debut! This season, Kodansha Comics has three great manga turned anime series for your viewing pleasure: Cardcaptor Sakura: Clear Card, Basilisk, and Kokkoku: Moment by Moment! Check out the streaming schedule below to find out when and where you can catch these great series, and don’t forget to see where the stories all began and catch up on all the manga before the anime airs! Keep yourself warm with these digital manga bundles! Brrrr ... It's COLD outside! There's never been a more perfect time to stay cozy indoors and catch up on some manga! Starting January 9, Kodansha Comics has launched 17 new digital manga bundles (all completed series or a anime-season equivalent) on comiXology!